Plus Size Kitten: I got hit by the musical bug.. 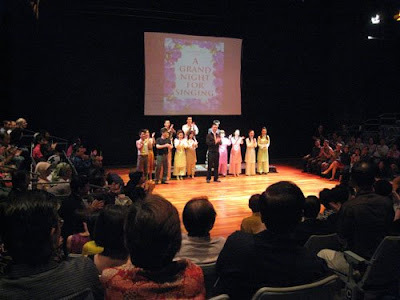 I'm really happy to have heard in one night, all the famous Broadway numbers, pop, rock, jazz and gospel hits. I particularly loved "Taylor the latte boy" sang by Jade Liew LY. She really opened up my eyes during this number and I just can't help but fall in love with her and the song. I enjoy Mama Mia! thumpin with Lion King and the savoring Sweeney Todd the Demon Barber of Fleet Street. 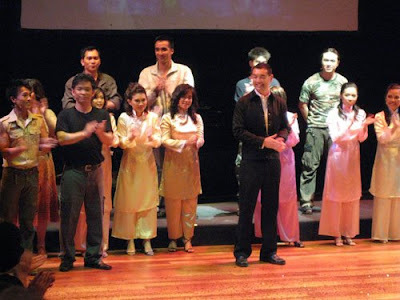 I was saddened by Miss Saigon, about a Vietnamese girl abandoned by her American lover. I must say it was a truly enjoyable evening to end my hectic day and the sums of most Broadway shows in just one night. I search in youtube for Taylor the Latte Boy and found this actress whom I've been watching Pushign Daisies, sing it and boy she's also got me..falling in love with Taylor the latte boy. singing "Taylor the Latte Boy"
I thought we had nightmare encounters in cinemas but u know what even in theater u can face the same "problems". It made me laugh, I didn't think I would find similar problems in another platform of place. In cinemas u hear ppl talkin about the movie "eh eheh this is the killer haha, omgomg like this like that eh this story is about etc etc" so in the theater I got this instead, a Japaneses woman singing 80% of the entire musical loudly next to me ( she must be thinking she's a part of the show). In cinemas u get earthquakes, ppl rocking their chairs n goyang kaki like no tomorrow? so in theater, the same woman singing n thumping her feet on the flimsy man made seating platform which rocks my seating row and the platform was thumping so hard, my heart was beating to it. I came to a musical to listen to a Musical Production, not some woman singing happily bcoz it makes her happy. It really spoiled my moment trying to embrace the theatrical experience. This is not a concert Madam. never mind, next time, i will buy early and don't wait for other people. oh uncle, u know at nearly end got disco songs and the singers invite audience from their seat to go dance at the center with them. The Directors also invite ppl by hand and dance with them. actually from what i observed, the sides also no bad seating. As the theater is small, it's quite close to the singers. too late lah. should have check with your uncle choong before i gave up buying the ticket. never mind, tell uncle choong to give headup for the future performance. wah jessie? which one your sis? like uncle thomas, want to pay also can't go..lol coz no seats. eh....how did jessie end up in here leh.. must be searching info about her sister performing?